The three issue arch of DH's Dark Horse Presents will start this February and feature Amala's brand new universe. The creation of Horton and Michael Dialynas Amala is a runaway... I'm sorry, does that say 'robot monkey'? Good lord, it's a robot pirate monkey! Dark Horse Comics is proud to announce a brand new three-part story from Steve Horton (DC Holiday Special, Superman 80-Page Giant) and Michael Dialynas (Popgun, Trinkets) appearing in Dark Horse Presents #9 – Amala’s Blade.Amala was once chosen as a child to be the spiritual leader for her country, to unite the Purifiers and Modifiers and prevent war. She fled into the night. Twenty years of war later, she makes a living as an assassin, but her past is ever ready to catch up to her. Aboard a massive pirate ship, Amala stalks the fearsome pirate captain Cha'Kooh ... but the voices in her head, manifesting as ghosts, keep getting in the way!Amala’s Blade will be featured in issues #9, #10 & #11 of Dark Horse Presents. 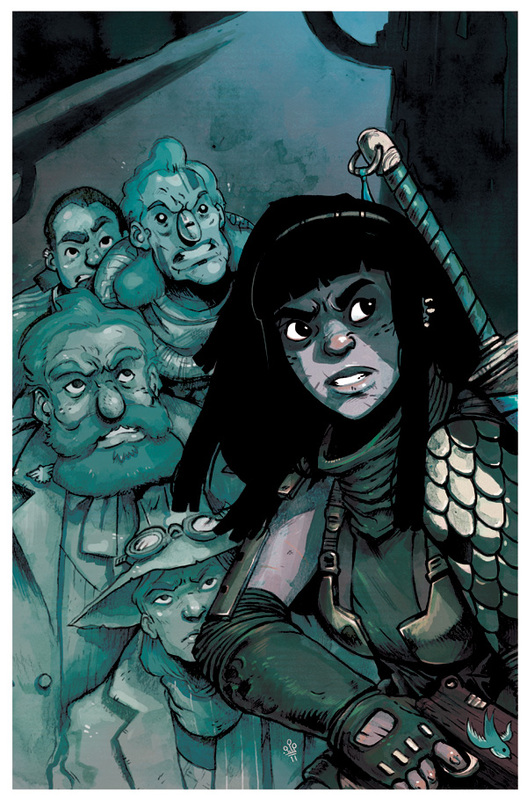 "Amala’s Blade is the steam punk-with-swords epic that I've been dying to tell," says Steve Horton, writer and letterer. "Thanks to the extraordinary and talented artist Michael Dialynas, we've brought Amala to life. Thanks to Dark Horse Comics, we've found an amazing and supportive publisher for our three-issue run in Dark Horse Presents. This story has heart, sword fighting, sarcasm, revenge, pirates, technologically modified villains, a girl steam punk heroine, and a robotic pirate monkey. What more do you need?" says Horton.